If you search for a wooden gazebo online, you’ll soon realise there aren’t actually that many out there. 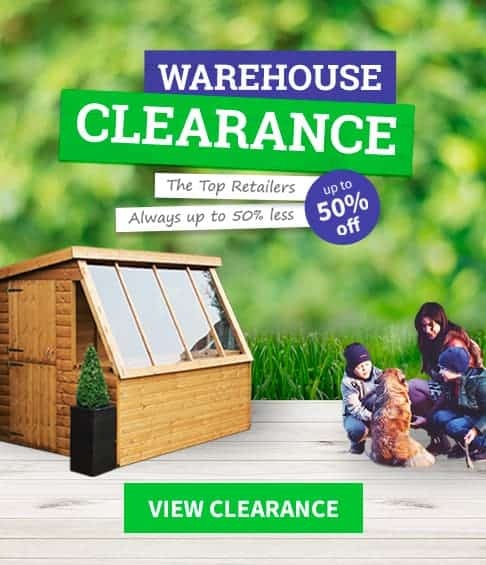 Whilst compiling this list, we were surprised for example, that some top suppliers such as Garden Buildings Direct, don’t actually sell wooden gazebos. However, whilst there isn’t a massive range of wooden gazebos available on the market, there are still quite a few really good models to choose from if you look hard enough. With most coming in at over £1,000, it is important to know that your money is well spent. That’s why at WhatShed we’ve taken the time to research the different wooden gazebos available and compiled this useful ‘Top 20’ list. 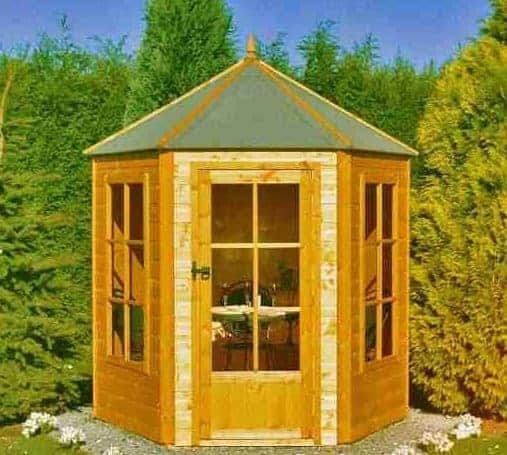 At WhatShed, we’re renowned for our in-depth reviews of garden buildings. 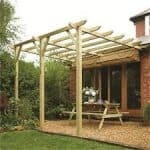 Therefore, we know exactly what to look out for in order to determine the best wooden gazebos on the market. This means you can 100% trust that the wooden gazebos that made it onto the list truly are the best off the shelf. With many high quality wooden gazebos out there, it was a difficult task choosing the best one. Our congratulations go out to the superb 11×10 Royal Hexagon Thatched Roof Gazebo which snagged the top spot on the wooden gazebos list. 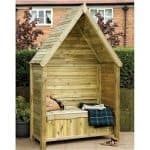 WhatShed specialise in providing high quality, comprehensive reviews on all outdoor garden buildings. Whether you are looking for wooden gazebos, a new garden shed or a beautiful impressive log cabin; check out our extensive reviews to find out which are worth investing in. There was certainly a lot of high quality, impressive wooden gazebos to choose from, but for us the 11×10 Royal Hexagon Thatched Roof Gazebo was the one to beat. With an attractive South African thatched roof, this superior quality gazebo is not just one of the best looking models on the market, but it’s also one of the most rigid and durable ones out there too. The timber has been pressure treated to give it a 15 year guarantee and eliminate the need for annual treatments. It is more than just a gazebo – you also have the choice to add comfortable seating too. So if you’re looking for wooden gazebos you can entertain in, this is a fantastic option. It isn’t just the thatched roof that gives this an edge over its competitors. The gazebo is also constructed with machine rounded timber. This gives it a smooth, extremely stylish finish. Whilst it features a largely open design, it does come with 3 small solid infill panels so you do get some sense of privacy. It is capable of accommodating 6-8 people so would ideally suit a medium-large size garden. We also selected this as the number one wooden gazebo thanks to the included installation service. The fact you do not have to put it together yourself is a major advantage. There are also a superb number of additional options to customise the gazebo such as a table, seats and cushion sets. No other wooden gazebos give you so many additional options. If you’re looking for something a little different, the 13×13 Hillhout Premium Sardinia is exactly what you need. This is by far one of the best wooden gazebos you can invest in for outdoor entertaining. We particularly love its versatility. 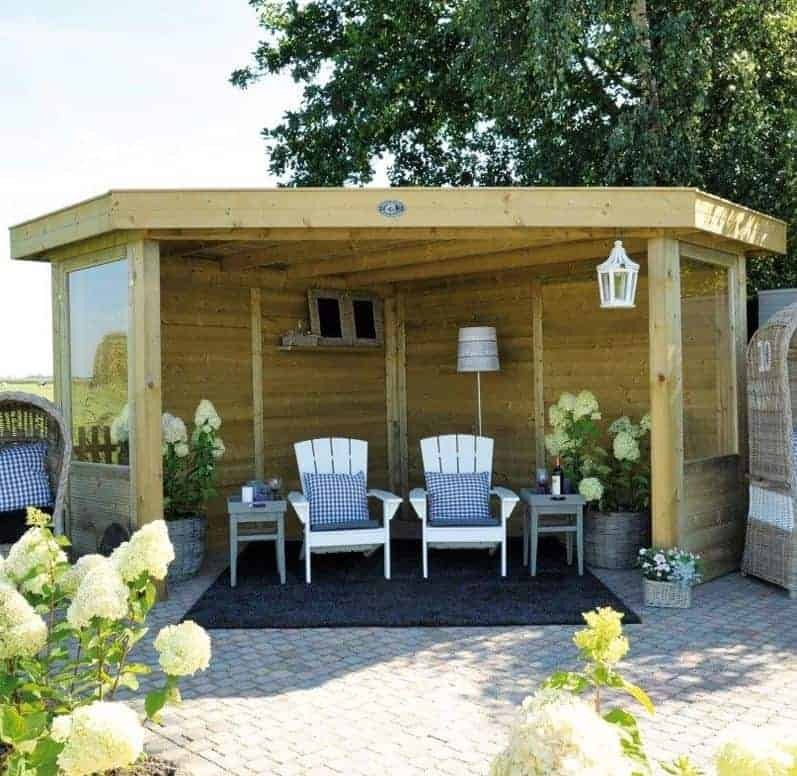 Thanks to the sheltered design, it could easily be used as an outdoor lounge or even a basic summerhouse. This is another gazebo that comes with installation service included. All you have to do is buy it, wait for it to be installed and then enjoy. 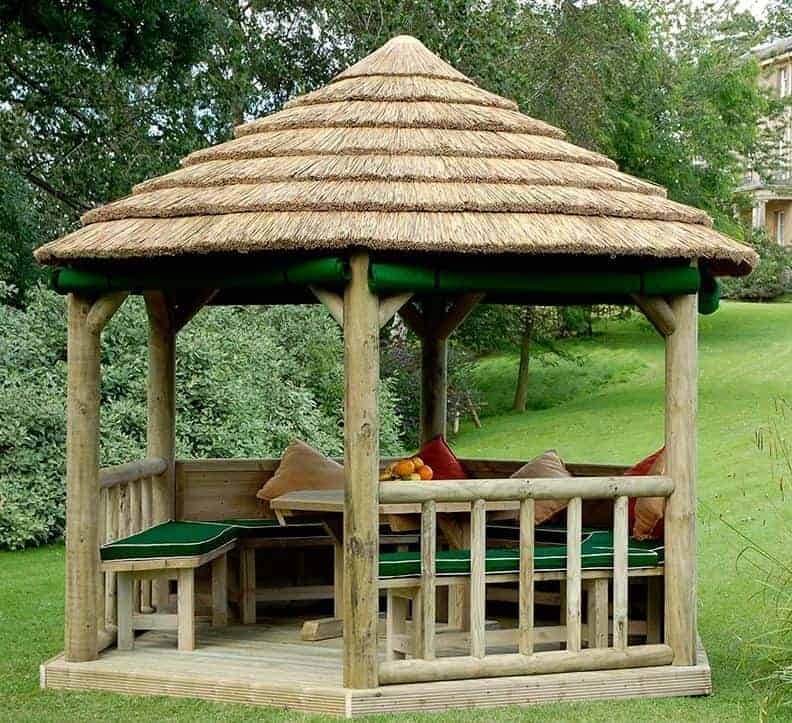 It comes with a great pent roof design which is pretty unique as the majority of wooden gazebos come with a tall, apex style roof which isn’t suitable for all gardens. So if height is an issue, this pent roof gazebo is the perfect alternative. We also love the rustic design provided from its strong, northern pine construction. To ensure it lasts, the manufacturer has also pressure treated the gazebo, also meaning you do not need to maintain it. Not only does this save a lot of potential stress, but it also saves money in the long term too. 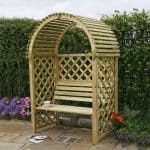 If you’re looking for wooden gazebos that will become a focal part of the garden, last for many years and offer shelter from the weather, then this is one of the stand-out models to invest in. At number 3 we have another Hillhout Premium model in the form of the stunning Montecristo. It features a slightly more open design than the Sardinia, with two closed panels attached rather than four. Like the other model this one is pressure treated to ensure it withstands all weathers without the need for treatments. You can rest assured that this will last for a very long time despite what the UK weather has to throw at it. So what makes it stand out from the competition? Largely, it is the sleek, sophisticated design. This is one of the few wooden gazebos that really makes a statement. If you’re looking for a classy, large area to entertain in the summer months then this is the gazebo you need. One additional unique benefit of this gazebo is the pent synthetic rubber roofing. It ensures even the heaviest of downpours are no match for the longevity of the building. We love that it provides protection against the elements, whilst providing a large amount of open space to entertain or relax in total comfort. 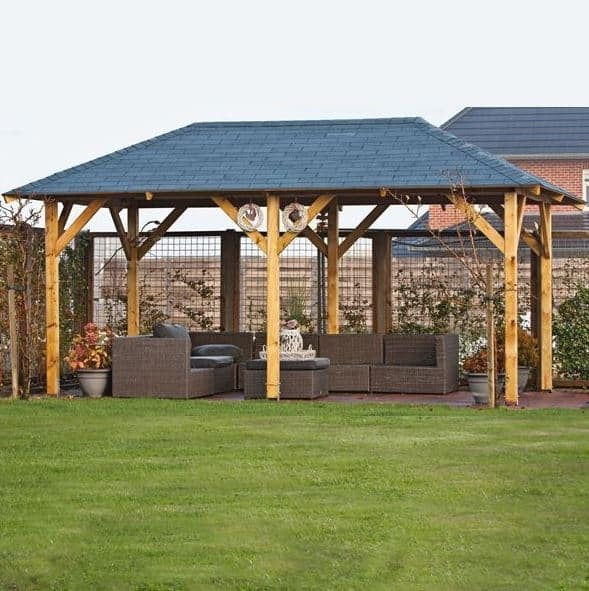 The Taylors Milan Gazebo comes in three different size options, making it a great choice for any garden. 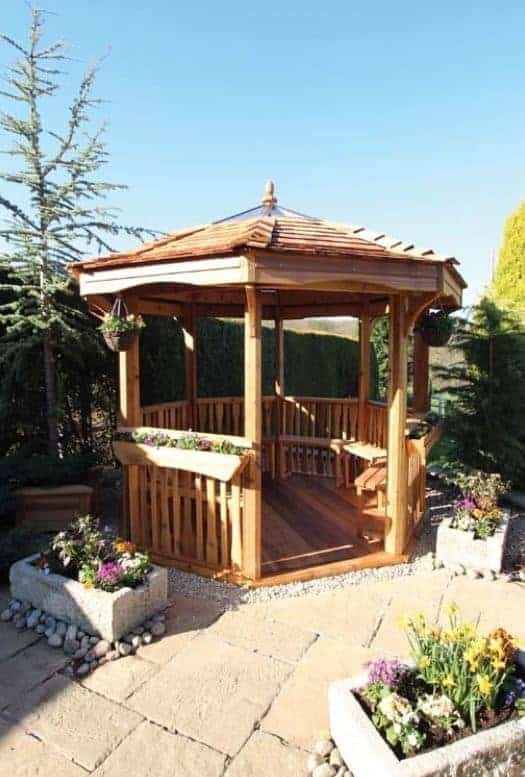 Exclusively sold at Taylor’s Garden Buildings, this is a striking octagonal gazebo created from high quality Cedar. What’s great about this material is it is naturally decay resistant. It is also much more protected against moisture than other types of wood, so without any treatments added, it is still a tough, weather resistant building. To boost its longevity further, the manufacturer has included roof shingles as standard. These not only ensure the roof is fully protected for years to come, but they add a unique decorative appeal to the gazebo too. However, it isn’t the durability that impressed us the most. This great looking gazebo has more additional options than any other wooden gazebos available. We especially love that you can add French or bi-fold doors, a roll down canvas and an upper panel trellis. You can literally give this gazebo any look that you want. 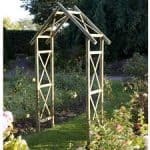 It is one of the most expensive wooden gazebos to make it onto the list but if you have the money it is definitely worth buying. The super-impressive Betty Hexagonal Gazebo 3.37m is the most attractive gazebo on the list. It looks like something you would find in a landscaped garden in the grounds of a beautiful manor house. It is guaranteed to make a fabulous addition to any large size garden. That is why we were extremely surprised by the low cost of the building. 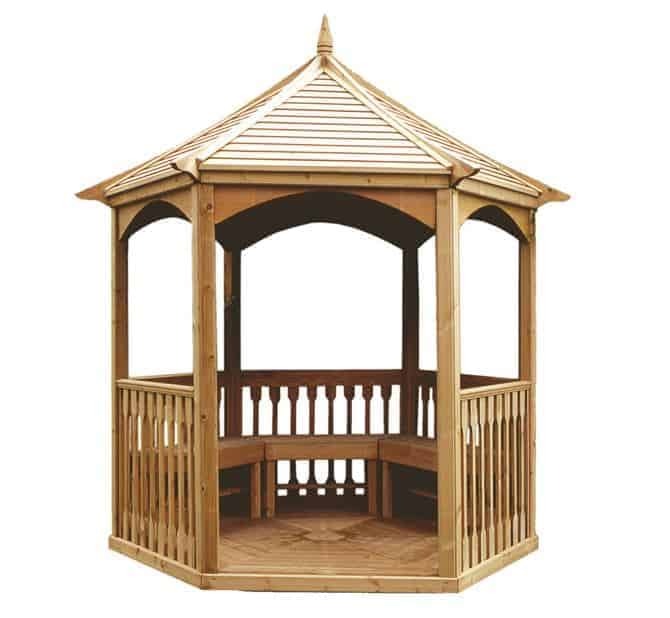 In our top 20 wooden gazebos list, this one offers the best value for money, whilst offering some pretty unique features. One of our favourite features is its storm protection. This means no matter how bad the weather gets; this gazebo isn’t going to get easily damaged. It is also constructed from tough laminated wood posts. So despite its extremely budget-friendly cost, it is guaranteed to last for a long time to come. If you have the luxury of having a large garden, you’ll want an impressive large gazebo. This 14×12 M&M Imperial Hexagonal Timber Roof Gazebo is one of the largest on our top wooden gazebos list, capable of entertaining 10-12 people. When looking at what was out there, M&M Imperial was one of the major players in the wooden gazebo market. With a strong, thick carousal style roof, this gazebo has a lot more to offer than just its sheer size. Pressure treated, it is capable of handling anything the British weather throws at it and will never require treatments to keep it protected. This maintenance free design is one of its major benefits. Whilst as standard the gazebo is impressive, it is the additional options that we love. If you’re willing to spend a little more you can add drop curtains, a roof lining, a table, seats and cushions sets to create a truly comfortable outdoor area. The Shire range of outdoor buildings is considered one of the best in the industry. Therefore, it is no surprise to find this chic 7’1×6’2 Shire Gazebo Summerhouse featured on the list. It is especially great for those looking for something a little different from the norm. It is also completely enclosed making it one of the best wooden gazebos for outdoor entertaining. No matter what the weather, it won’t spoil your al fresco experience. Due to its more compact size, this is mainly suitable for those looking to accommodate 2-3 people. Another added benefit of this gazebo is that it could potentially be used to store tools in winter. So you basically get a 2-in-1 building. This is also one of the cheapest wooden gazebos out there, offering exceptional value for money. Wooden gazebos don’t often come with a floor included, which is why we had to include the J-Class Medium Brompton Gazebo 7’9” x 6’8” to the list. 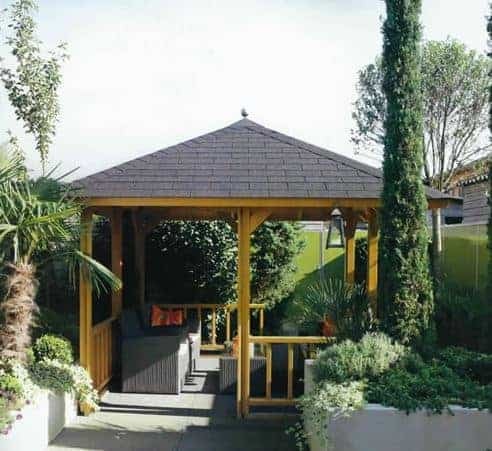 This gazebo is offered at a very reasonable cost and is created from Northern European Redwood. It is one of the strongest wooden gazebos on the market too, benefitting from thick 19mm cladding throughout. Thanks to a strong permanent wood preservative, it also doesn’t require any annual treatments and it comes with a fantastic 15-year guarantee. This makes it great for those looking for a gazebo that won’t break the bank, but will last for many years. We personally love its functional, practical, yet stylish design. If you’re looking for wooden gazebos that offer a unique, stand-out design whilst remaining practical and durable, then this Brompton model is a good choice. The enclosed Hampton Garden Gazebo comes with an extra high ceiling. It’s actually difficult to find enclosed wooden gazebos as most tend to feature a more open-plan design. However, we didn’t just choose this model for its enclosed benefits; it happens to come with a few unique benefits. In particular, we love the decorative detailing that you won’t find on any other model. 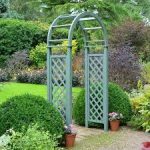 These include a beautifully tapered roof and two attractive trellis panels. You can add climbing plants to the trellis to create a stunning feature in the summer months. As you would expect from wooden gazebos of this size and quality, the wood has also been pressure treated for zero maintenance benefits. Perhaps the best part of this gazebo however is the fact it comes complete with 3 sets of benches. This isn’t something you get very often, especially with wooden gazebos of this price. All in all this is a fantastic model that will fit in any garden and is suitable for all-weather outdoor entertaining. A lot of open design wooden gazebos tend to look the same. That’s why we were happy to come across the Lugarde Open Gazebo 2.4m x 3.0m. Unlike its competitors, this one comes complete with decorative balustrades and a stunning pyramid roof. One of the highlights of the gazebo is the great customisable options that come with it. For example, you can choose where you want the decorative balustrades to go and you can opt to have it finished in a choice of transparent coloured treatments. Most impressively however, is the included roof shingles. A lot of wooden gazebos require you to pay extra for shingles as they are the most durable type of roof covering available. Not only does it come with shingles included, but you can also choose from green, brown, red, blue or black colours. So if you’re on the lookout for a gazebo you can really make your own, this is by far our most recommended model currently on the market. There are actually a few different variations of this Regis Octagonal Gazebo. However, we chose pack A because we feel it is the one that will suit most people’s needs. This variation comes with two balustrade panels and two trellis panels. So what makes it unique enough to be included in the list? Well, it also comes with two glass and one mirrored lattice screen. The glass panels provide protection against the wind and rain, whilst still allowing plenty of light to enter the gazebo, whilst the mirrored lattice screen offers a more spacious look. If you love traditional style gazebos with a unique twist, then this is definitely one you will want to check out. Like the others on the list, this has been pressure treated to ensure it lasts against the elements. 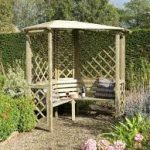 Out of all of the wooden gazebos on this list, the 10ft Budleigh Haxagonal Gazebo is one of the most simplistic. It benefits from a band-style design and doesn’t come with any sides. This makes access in and out of the gazebo especially easy. Pressure treated and constructed from FSC sourced timber, it is remarkably durable and extremely affordable. It will suit most budgets and provides a great shaded area to entertain in the warm summer months. We highly recommend it for those looking for a no-nonsense, basic yet pretty gazebo. Prepare to be impressed by the largest gazebo on the list. 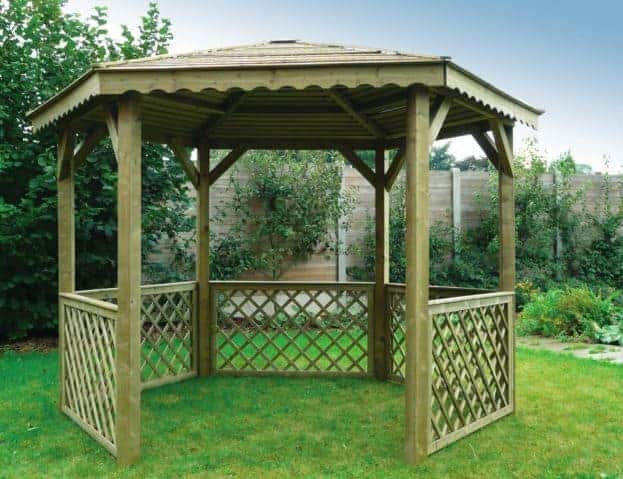 You will struggle to find larger wooden gazebos than this incredible 20×11 Waltons Superior Garden Gazebo. It will comfortably fit a large amount of outdoor seating and offers a great sheltered area that will protect you against unpredictable showers. What’s really outstanding about this huge gazebo, is its low cost. You would typically be looking at paying double the cost of this model for a smaller gazebo. It could even be used as a hot tub shelter. Its size ensures you have an almost unlimited amount of uses for it. To complete its value for money, the timber has been pressure treated, which means it doesn’t require maintenance and it is guaranteed to last at least 15-years. You’ll notice on your search for wooden gazebos, that many of them pretty much look the same. That’s why it can be so difficult to choose the best one for your garden. 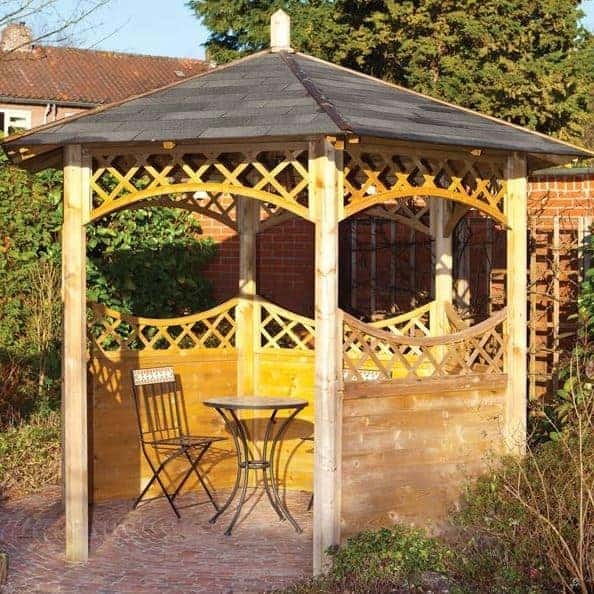 This Brettenham Gazebo offers a slight twist on the standard traditional design. It comes with a great green tint, allowing the natural grains of the timber to really shine through. That is one reason why this model made it onto the list, but its benefits don’t just stop there. As well as being pressure treated for a long lifespan, this is one of few wooden gazebos to feature a variety of panel customisation options. This allows you to ensure you get exactly the right look you are going for. It is fantastically priced too. Whilst it may be one of the more basic models out there as standard, the customisation options help to make it truly stand out. 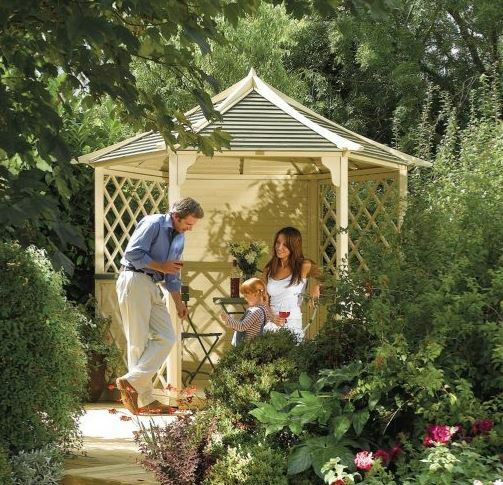 Ideal for larger gardens, this Kiosk Hexagonal Gazebo features a stunning pavilion design. 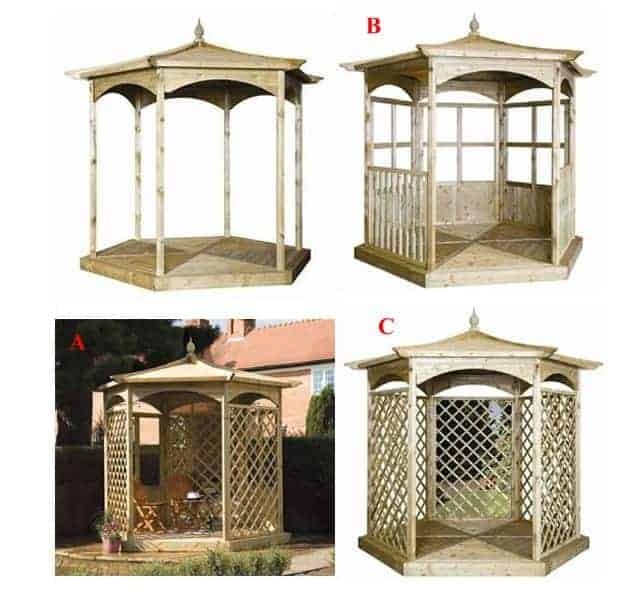 It has several features that set it apart from other wooden gazebos on the market such as diamond lattice panels, a slatted wooden roof and exquisite profiled fascia boards. Together, they give this gazebo a truly magnificent look that sets it apart from the competition. What’s most impressive about this model is its price. At under £1,000, you are getting extraordinary value for money. It’s going to last you at least 15 years and you don’t need to carry out any maintenance. It offers a spacious outdoor shaded area that is perfect for summer BBQs and simply relaxing and enjoying your garden come rain or shine. 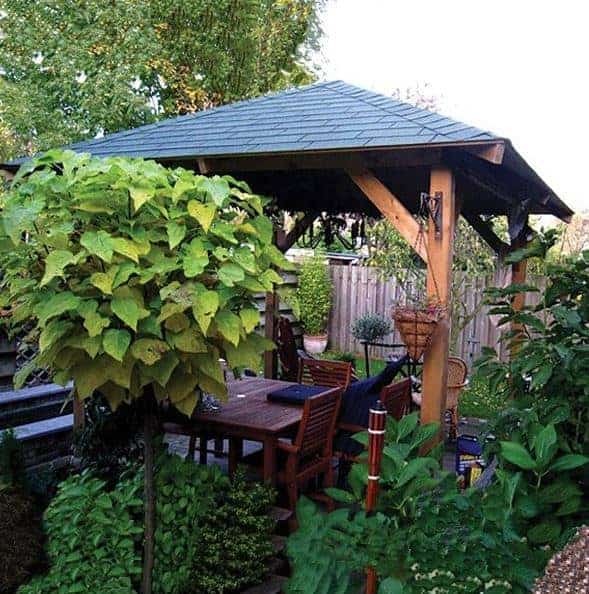 A lot of wooden gazebos are designed with larger gardens in mind. So for those looking for something a little more compact, the 10×8 Waltons Medium Garden Gazebo is perfect. Constructed with high quality materials, this gazebo has a unique look thanks to its curved lattice style panels attached to the roof. This offers more shade than your average gazebo and also adds to its decorative appeal. 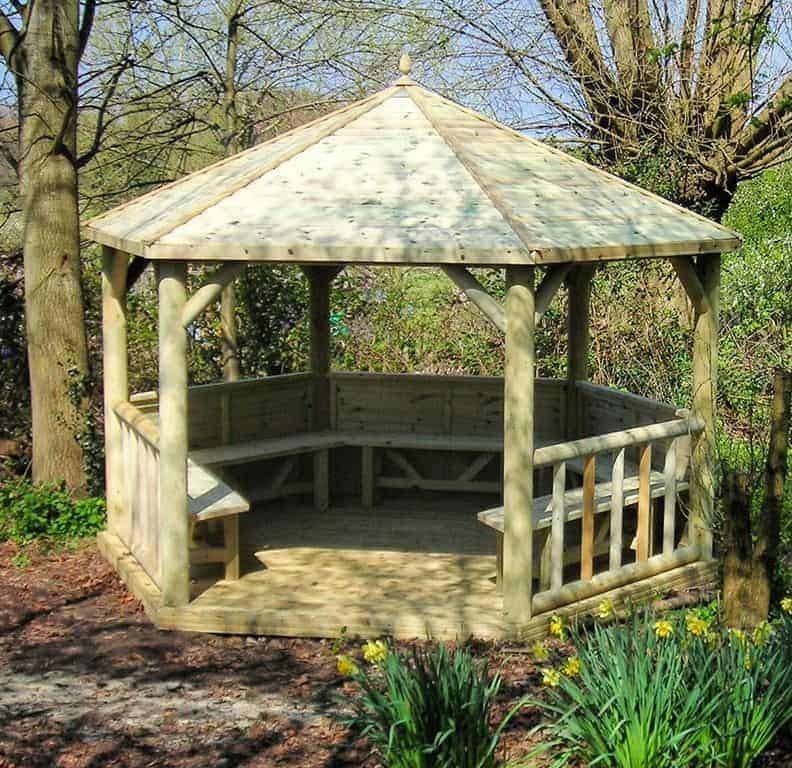 Like many of the wooden gazebos featured on our list, this one is versatile enough to be used for many purposes. It can be turned into a bar area for your classy summer parties or simply used as a seating area all year round. You also have the option to add high quality shingles which will not only prolong the life of the building, but also add a great stylish element. All in all this is a brilliant model that will suit any style garden. This 11×11 Waltons Tourist Wooden Garden Gazebo benefits from an extra-tall design. This taller than average style provides an extraordinary amount of headspace, making it super-comfortable to manoeuvre around in. It has more of a square design compared to other wooden gazebos and is built from exceptionally strong materials. Like others featured on the list, this one is also pressure treated for zero maintenance benefits. 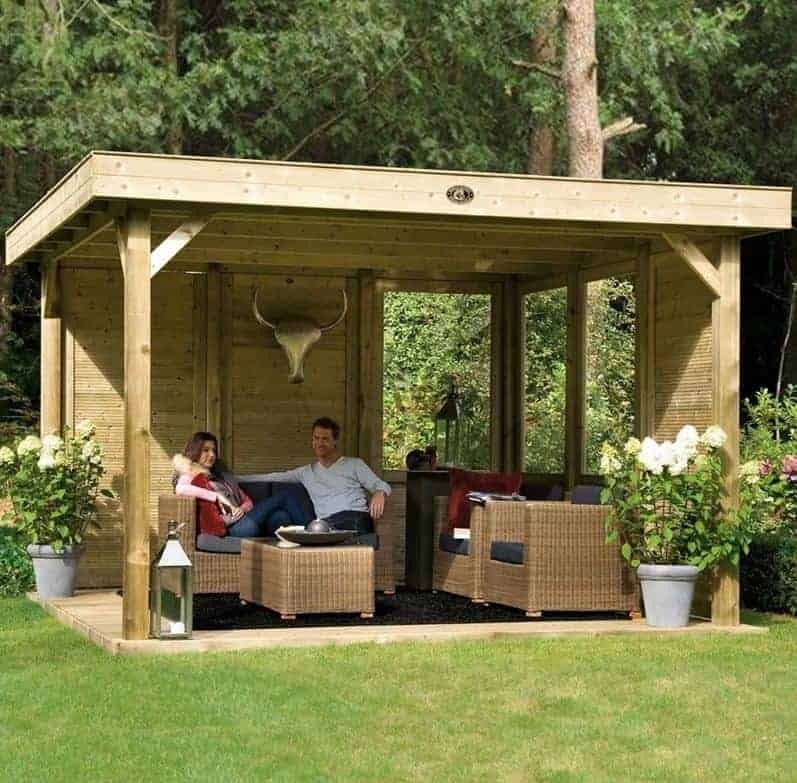 Being one of the larger wooden gazebos available, this would ideally suit those looking to create a large outdoor seated area. We love its height, unique almost oriental design and the level of shade it provides. If you’re looking for a classic style gazebo that won’t break the bank then this one is an excellent contender. 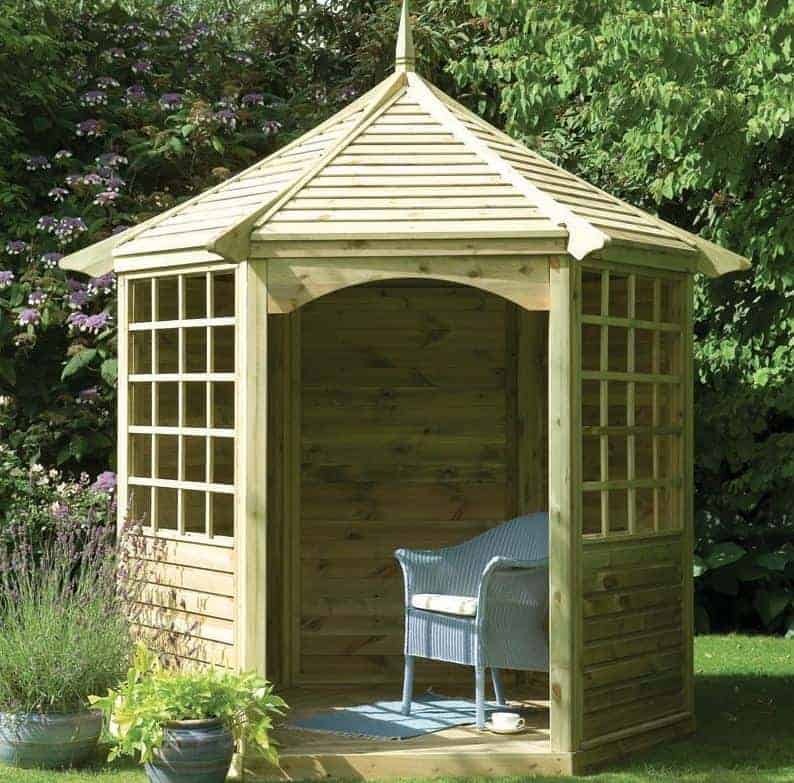 When you take a look at the cost of the Rowlinson 2.7.3m Gainsborough Wooden Gazebo, it’s easy to think you’re going to be getting a fairly flimsy, lower quality gazebo. However, in reality, this striking model offers extraordinary durability and a very high quality design. 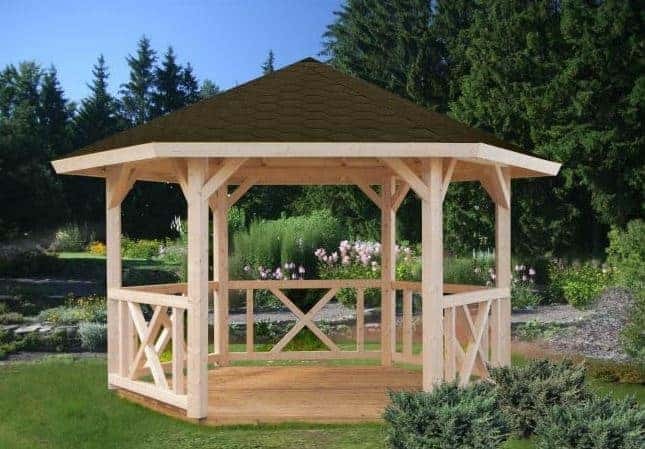 Compared to other wooden gazebos in this price bracket, this one boasts a beautiful, unique design. What we really like about it is the ability to use the lattice screen walls as a frame to grow climbing plants. This adds to its visual appeal and makes it look extraordinary in the summer months. Its low cost and stylish design aren’t the only things that have earned this gazebo a spot on the list. It is also fully pressure treated, which means you will not have to treat the gazebo to ensure it withstands the unpredictable British weather. The simplistic Waltons Economist Wooden Garden Gazebo is great for use as an outdoor dining area. We especially like its modern, sturdy design. Created from pressure treated high quality timber, this is one of the few wooden gazebos which doesn’t require treatment. So if you’re looking for a basic, yet high quality gazebo that won’t break the bank, this is a great model to go with. Its open design means you benefit from easy, convenient access; making it easier to transport garden furniture in and out of the gazebo. If you’re willing to spend a little more money, we would recommend getting the shingles as shown in the picture. This provides additional weather protection and ensures the gazebo lasts for many years to come. We’ve included this on the list for its reliable, practical, affordable and durable benefits. 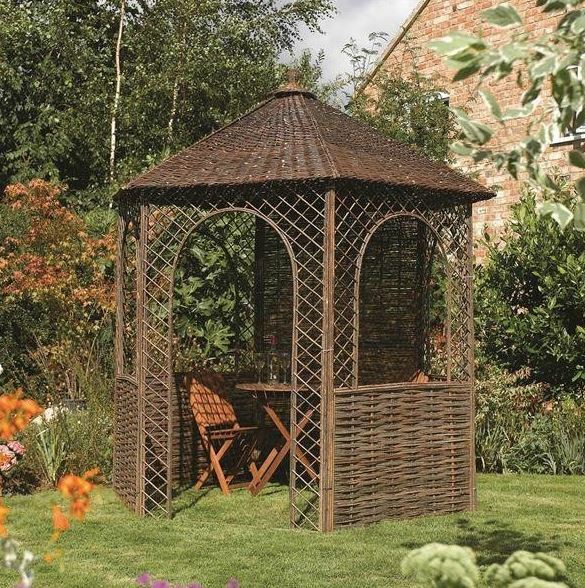 This 8’8×8’2” Rowlinson Willow Gazebo is the most affordable on the market. This is largely down to its unique willow design. Whilst the low cost is the main reason we’ve added it to our top 20 wooden gazebos list, we also really love its design. 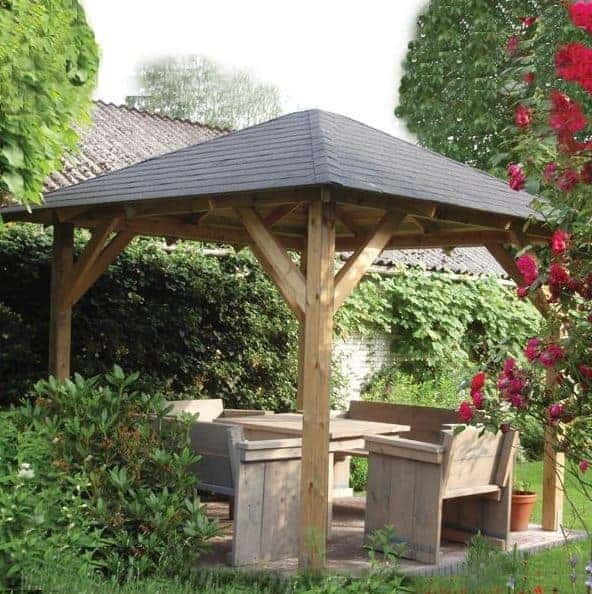 The 6 sided gazebo has a very quaint, picturesque style that will look great in any garden. Its beautifully rustic appearance is something you are sure to fall in love with. Another unique quality of this gazebo is the fact it can be disassembled. This is highly recommended in winter as it is not designed to withstand harsh weather conditions. The fact you can quickly reassemble it is fantastic and not many gazebos give you this option. So if affordability is your main concern, this is definitely the gazebo to opt for.